East Africa's high-speed internet access has been severely disrupted after a ship dropped its anchor onto a fibre-optic cable off Kenya's coast. The ship was waiting to enter Mombasa - one of Africa's busiest ports - when it anchored in a restricted area. It could take up to 14 days to repair, cable owners The East African Marine Systems (Teams) told the BBC. This is one of three undersea cables to have arrived in the region since 2009, delivering faster internet access. The cable run by Teams, which is partly owned by the Kenyan government, was damaged at the weekend. 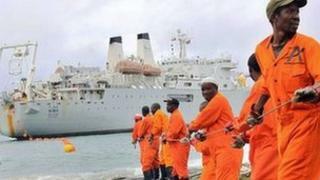 Internet service providers and mobile phone operators have re-routed to the Seacom link - which was not damaged by the dropped anchor. But the company has only bought a small amount of bandwidth because of cost. The BBC's Noel Mwakugu in Nairobi says as a result internet connections are expected to slow down by 20% in Kenya, Rwanda, Burundi, Tanzania, Ethiopia and South Sudan's capital, Juba. Seacom - the first to be up and running - links East Africa to Europe, India and South Africa. Teams links the region to the United Arab Emirates - and Eassy, which went live in July 2010, links countries along the East African coast. Correction 28 February 2012: We have amended this story to make clear the Eassy cable was not damaged in this incident as we originally reported. Is Kenya sabotaging its broadband future?